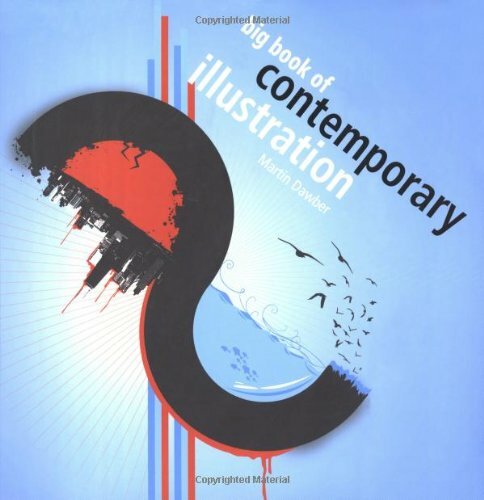 For the money this has to be a bargain book: over a thousand images from four hundred artists. The eight chapters: Built environment; Natural world; Comic, Graphic; Technical; Lifestyle; Travel; Imaginary cover, more or less, every sort of commercial illustration you'll find. Even more impressive is the range of work because each artist is sort of unique. In the Tech section you'll see the usual cut-away engines (page 232) to very casual but interesting renderings of a cell phone by Alexia Tucker (page 205). The Graphic section has some stunning letterforms and complex graphics. Si Scott has created an amazing football player out of type (page 179) Thien Tran does an intriguing Psalm 23 with type and curlicues (page 171) Joseph Gonzalez, Robert Marras and Sorin Bechira (all on page 181) produced visual explosions that really grab the eye. The Imaginary section I thought was the weakest because, although most of the artists have mastered the use of paint or digital techniques, they don't all have the imagination to create fresh fantasy ideas. The same old monsters and space vehicles abound. This seems a genre where a new visual idea pops up and it gets copied until the next new thing. The book's production is nicely thought out with many spreads that feature different artists interpretation of the same subject: churches (pages 44.45) dogs (page 102/103) or exercise machines (pages 238/239). Usefully the back pages have contact numbers and web pages for the artists but someone screwed up by not including a page number for each. The printing uses a 175 screen on a matt gloss which makes the book look pretty good, especially the square format. No large images? No video? Not for this one. I'm re-publishing some of Robin Benson's reviews and they don't come with larger pictures or video. I may add the video in the future if I can find the book.